myDBR offers an extension API for your disposal. With the extension API you can seamlessly add new commands and functionality as needed on top of the myDBR core. Extensions can be written in standard PHP language. myDBR takes care of the hard work and provides an easy API for you. Example extensions with full source code is included. 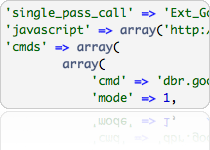 With example code included, you can extend myDBR functionality.